This dress is fairly easy to find and is usually in good condition when found. 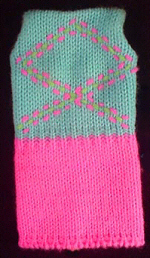 It features a sleeveless knit dress with a blue top and hot pink skirt. There is a stitched accent on the bodice. Both lined and unlined versions have been found, it has been my experience that the unlined version is more common. 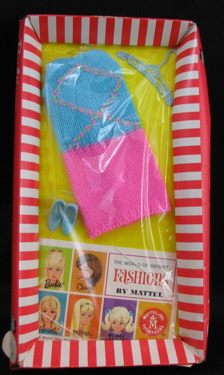 An earlier vintage Barbie ensemble had the same name, Knit Hit #1621 (1965).